Cage cleaning and bedding disposal procedures are now simpler, safer and more productive with the VIVA Bedding Disposal Workstation. 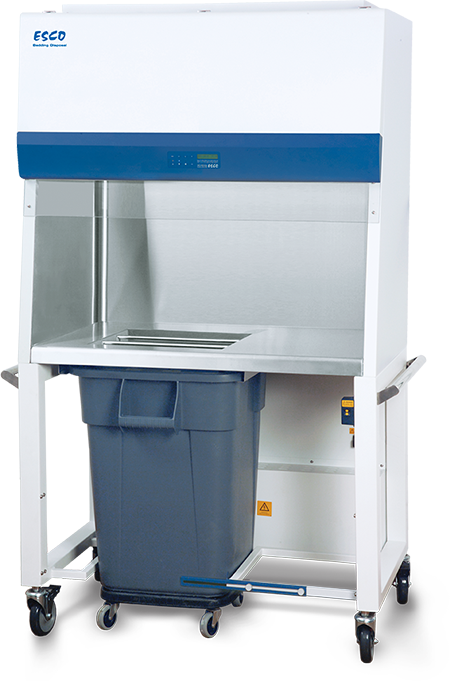 Specifically designed for the animal research laboratory, the mobile workstation protects personnel and the lab environment from exposure to allergens and unpleasant odors. The industry-exclusive hydraulic height-adjustable stand allows the work surface height to be adjusted to user preference therefore minimizing strain during repetitive operations. An integrated waste container enables direct disposal of waste items within the work zone. Sentinel™ Microprocessor controller supervises all functions. Industry-exclusive integrated adjustable height hydraulic stand improves ergonomics and enables the workstation to be adjusted to the user's height. Long life ULPA filter protects the user and the environment from harmful particulates created when dumping cages. NanocarbTM activated carbon filter removes odors. Pre-filter extends the life of the main ULPA filter and can be safely changed within the work zone with the airflow operating. Work area lighting is bright and uniform to help improve productivity. Blower system is designed for high performance operation, maximum energy efficiency and minimal maintenance. Single piece stainless steel work zone liner simplifies cleaning. Offset opening in the work surface provides a staging area for cages to be dumped. This can facilitate faster and safer cage processing. A 40-gallon NSF listed waste container is mounted to the work surface allowing for rapid disposal of waste materials within the work zone. Esco ISOCIDE™ antimicrobial coating on all painted surfaces.